The hottest pool of the Montezuma hot springs feels like a billion pinpricks and is immediately invigorating. What does the state of New Mexico and the United World College have to do with sailing the Caribbean? I love reading the many sailing blogs on the net. However, what is missing for me, is where my fellow cruisers came from. How did my fellow sailors get to the Caribbean? Where did their dream begin? What are their roots? The answer gives hope to thousands of young and old alike who dream of one day being “out there”, too. The trip to Colorado was a lot of fun. On my last day out I was able to stop by one of my favorite haunts, the Montezuma Hot Springs at Pemberton, a tiny city, near Las Vegas, New Mexico. The Montezuma Hot Springs is more famous for the castle perched above it than for the springs themselves. That is saying quite something since most hot springs have a strong following and diverse reputations. The Montezuma castle was built by the Atchison, Topeka & Santa Fe Railroad as a luxury hotel specifically for the well-to-do. The castle is over 90,000 square feet with 400 rooms. It is actually the third structure built on site as the first one burnt to the ground about a year after completion in 1881. The second structure suffered the same fate on a similar time table. Perhaps the conflagrations were by chance, perhaps through arson or because of bad wiring. These were the first buildings in New Mexico to have electric lighting! A building of such distinction needed an architect of the era to design it. The famous architectural firm Burnham and Root from Chicago designed the structure. Theodore Roosevelt, who loved the west was a guest, as was Ulysses S. Grant, William Tecumseh Sherman and more notorious guests like Jesse James and Emperor Hirohito from Japan. Unfortunately, the hotel’s greatest asset, it’s remote setting, was part of it’s undoing. The immense structure was deemed a financial failure and it closed as a hotel forever on October 31st, 1903. The bare knuckles boxer Andrew Chiariglione, better known as Fireman Jim Flynn, used it's vast halls to prepare for his challenge for the world title against Jack Johnson on July 4th of 1912 in nearby Las Vegas, New Mexico. The training was for naught, as the match was stopped by the Las Vegas Sheriff after Flynn was warned several times against head butting. "An occasional movie was filmed on site, including The Evil"
The YMCA owned the building for a short time. The Southern Baptist Church used it as a college from 1922 until 1931. In 1937 the Catholic Church purchased the old hotel and Mexican Jesuits operated it as a seminary until 1972. An occasional movie was filmed on site, including The Evil, but mostly the building sat vacant and fell into ruins to the point of being considered unsafe. In 1981 the spectacular building received a new owner and a new mission. Armand Hammer purchased the old hotel for use as the US campus of the United World College, or UWC, a school with some mystique. The College was founded after World War II in an attempt to foster world peace and discourage the nationalism which was, in part, at the root of the world war. "UWC is the only global educational movement that brings together students from all over the world – selected on personal merit, irrespective of race, religion, politics and the ability to pay – with the explicit aim of fostering peace and international understanding." In order to be selected for study at the college you must be very bright. Some of the students and faculty tell their stories. You can take a tour of the castle grounds at various times during the year. I was blazing through New Mexico on my way to a spiritual event in Aurora, Colorado, so I did not have time to take the tour. The hot springs are another matter! "there is an iron ladder which brave bathers use to lower themselves into the caldron"
Montezuma Hot Springs has one feature most other springs lack: One very hot pool! The springs vary in temperature from 98 to 112 degrees. In the rustic "hot" pool, there is an iron ladder which brave bathers use to lower themselves into the caldron. "The buildings are gone and except for rustic soaking tubs the springs are undeveloped"
There are at least three pools to choose from. The use is fairly light during the week so you don't have to share this gift from higher powers with too many others if you don't want to. In days gone by the springs were enclosed in bath houses. However, the buildings are gone and except for rustic soaking tubs the springs are undeveloped. "Follow the rules, the most enforced of which is no bathing in the buff!" While entrance into the springs costs nothing, there is a price. Follow the rules, the most enforced of which is no bathing in the buff! The county mounty watches the springs like a hawk, and enforces the speed limits on the roads leading to the Montezuma Hot springs. While I prefer to bathe in the same suit I was born in, if that is the only way to keep access open, I am for it! Since I did not bring my suit, I stripped to my underwear which is about all that is required. I look forward to learning about the history, the people, the culture of the many places I visit on my sailing adventures through the Gulf of Mexico, Cuba, Guatemala and the Caribbean. I am sure the stories will be as colorful as that of the Montezuma Hot Springs and Montezuma Castle near Las Vegas, New Mexico. 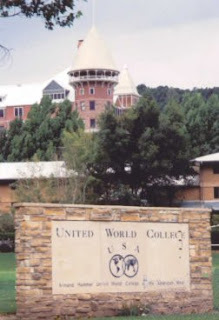 I am also sure I will find symbols of hope for world peace like the one fostered by the United World College (UWC).